Last fall, Alumnae, family and friends donated $28,846 to our 40 ergs in 40 days campaign. Your support helped us purchase 22 ergs and 4 erg bikes. We asked for 40 ergs because that is what we need to run one varsity practice instead of the two to three we currently have to accommodate the entire team. Given our success of this fundraising campaign and the recent success of the Hadley Chase Regatta & Fundraising dinner, we are only $9,000 away from securing all the funds need to purchase the final 18 ergs. 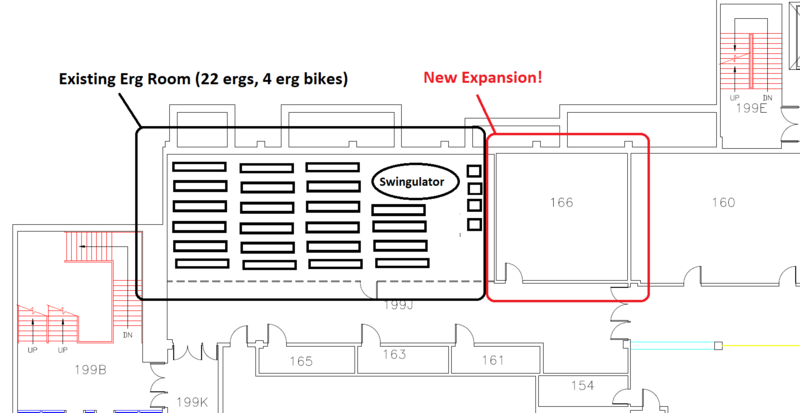 In addition to new equipment, the athletic department is renovating and expanding the UMass Rowing ergometer room to create more space that will allow us to add more equipment. What will adding more equipment do for the program in this new space? 1. Opportunity for the team to train at one practice time with more equipment! More athletes training at one time, completing more miles, makes for faster splits and bigger gains! 2. Enhance team cohesion and morale! Having all members of the team at practice would provide opportunities for more team meetings, team bonding activities, and increase cohesion. 3. Remain competitive with top programs in the country! Enriching our existing space and increasing our erg fleet will draw in top prospects! We are just $9,000 away from our goal of creating a new and dynamic work space. Just like last year, if you are interested in sponsoring an ergometer please contact Heather Palmer at hpalmer@umass.edu. Sponsorship begins at $1,000. Current rowers and young alumni (class of 2009 or younger) can partner to sponsor an ergometer. You can spread your gift out with monthly payment options, available for gifts of all levels. Please consider making a gift today to make this project a reality! A $50 donation will help the Minutewomen kickstart their campaign in transforming their indoor erg facility! Receive a Thank You letter from one of the women! A $100 donation will provide the Minutewomen with momentum in their fundraising campaign! Consistency in giving yields consistency in training gains! Receive a Thank You letter from one of the women! A $250 donation will help the Minutewomen get one step closer to a “personal record” or PR in their fundraising efforts and later on the erg! Receive a Thank You letter and personalized video from members of the team! A $500 donation will assist the Minutewomen with “dropping the hammer” in their training. The summation of their individual gains will produce big boat speed at NCAAs! Receive a Thank You letter and personalized video from members of the team! A generous donation of $1,000 to the Minutewomen provides the current team and rosters to come with an ergometer in your name! A plate will be mounted on the erg as a permanent thank you! Receive a Thank You letter and personalized video from members of the team!